Visit these War Veteran's Memorials throughout Chicago, the suburbs, and around Illinois at any time of the year, but especially during the month of May when spring flowers bloom for Memorial Day. Veterans' Memorial Park, 2820 E. 98th St., Chicago. -- "(This) southside park Veteran's Memorial Park ... was a natural extension of the patriotic attitude that prevailed across the country during and after World War II." Soldier Field, near downtown Museum Campus -- "Built in honor of World War I veterans..., Soldier Field is the home of the Chicago Bears...and the Veteran's Sculpture and Water Wall." 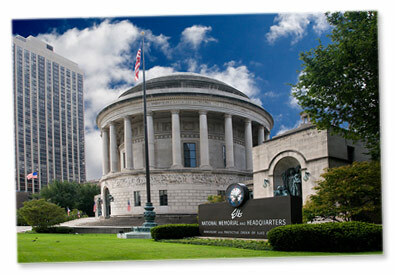 Elks National Veterans Memorial, 2750 North Lakeview -- "With its massive dome, heroic sculptures and intricately detailed friezes, the memorial is a distinctively American interpretation of classical greatness." Vietnam Veteran's Memorial , riverfront, between State and Wabash -- "It features a wall containing the names of the more 2,900 servicemen and women from Illinois who are either missing in action or were killed in the war." Korean Memorial, at Kennedy Park -- "Chicago's Kennedy Park dedicated its Korean War monument on September 15, 1988, making it the country's first memorial to those who served in that conflict." Butch O'Hare Exhibit, O'Hare International Airport -- The airport "is named for Lt. Cmdr. Edward 'Butch' O'Hare, a World War II fighter pilot from Chicago known as one of the greatest heroes in naval history." 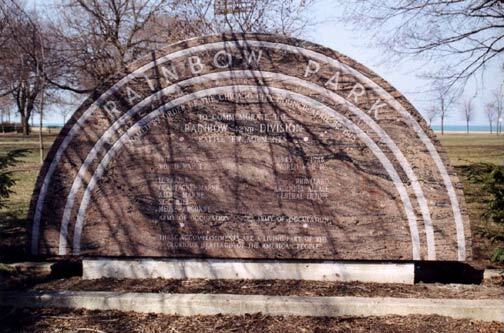 Rainbow Division Monument, Rainbow beach -- "In August 1917, the 42nd Rainbow Division was formed from National Guard units in 26 states, including Illinois, and the District of Columbia." 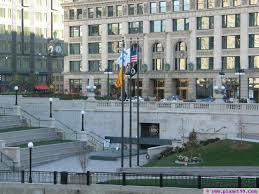 Eternal Flame, Daley Plaza -- "Eternal flame in memory of the men and women who have served in our armed forces. Army, Marines, Navy, Air Force, Coast Guard, National Guard, Reserves and Merchant Marines."